It’s been just over a week and a half since I finished my last project Mamore. Similar to my previous project, now I’ve had a week to clear my mind, I’ve decided to write a post reflecting on the experience and summing up a couple of the things I have learnt or came across during development. The idea and design of Mamore was solely the result of the IGM competition. In fact as I mentioned in my last post, it was brainstorming with the idea of growth from which the game was developed. As a result, during the ideas development stage I was very much aware that development of game features was going to be constrained by the limited amount of development time. And that, whilst the competition stated that games did not need to be perfect or necessarily finished for the competition, they had to be finished and/or complete in a playable sense. At times I felt this limiting in terms of creativity, stopping me from going down and trying different avenues. However, I did find that it kept me focused on the core game and gameplay, preventing me from going down rabbit holes that would take time away from areas that needed it. For example, during development I focused on making a minimum viable product (ExtraCredits did a great Youtube video on the subject). This way, if time became constrained I would at least have a playable game. For Mamore, this was staying focused on the enemy block’s AI and the life block logic, the two elements that I felt around which the game was based; in hindsight player movement should have been in this list, but I’ll get to that in a moment. Elements I left until last were the purchasable items, turrets and traps, particle effects, animations and sounds; things I wanted to add to the game but felt weren’t necessary to the core experience. This is something that caught me near the end of the project, in fact on the day I submitted it. Much like in Click ‘n’ PoP where input was key, in Mamore a key element was making sure that movement felt right. Too often I have played a game, this applies to platformers especially, where the players movement just feels off, and for Mamore this is the core gameplay element. 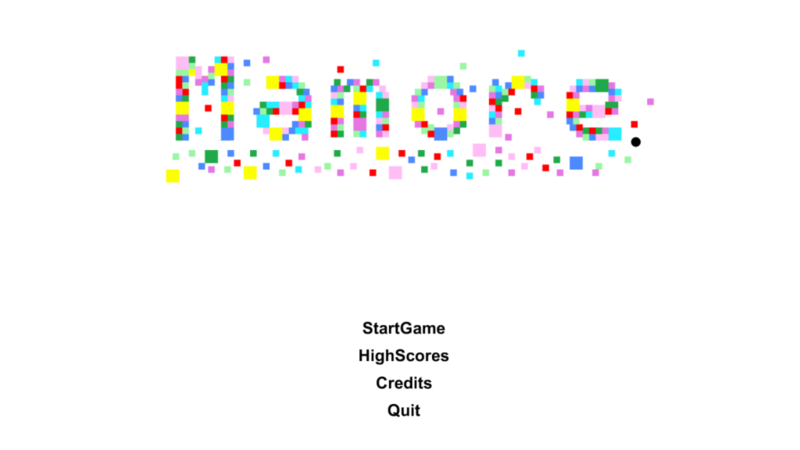 Now, I should say that unlike Click ‘n’ PoP which was actually broken, Mamore was not broken, it just didn’t feel exactly how I wanted it to; the player’s movement was just a bit slow and sluggish in nature. It played fine, and performed as it should, it just needed some refinement. And so this is exactly what I did; on the morning I was planning to submit my project I decided to put my head down and spent the whole of the morning playing with various values, tweaking them until the player’s movement felt just right. In hindsight I should have done this a lot earlier in the development cycle, which would have allowed for further refinement. However, unfortunately that was not the case, though in the future this will definitely be at the forefront of my mind when I start a project. I feel that this projected helped to highlight that sometimes you need to focus on the core game and try and keep feature creep at bay, as this can consume time you may not have, especially if you have a tight deadline. It also made me realise that you should make sure you have all the base mechanics tuned, at least close to ideal, early in development, so as to allow for more time to fine tune. Overall I probably learnt many more things from this project than just the two listed, some I don’t even realise, but I feel that the above two concepts are things that, after a week and a half, stand out clearly in my mind. Much as I said in my previous post, whilst I realise the game is far from perfect, I am happy with how the game turned out and most of all I enjoyed the process. A few weeks back, around the time I was finishing off Balloon pop, I was visiting HumbleBundle, if you haven’t heard of this site you should seriously check it out, games + charity = Awesome, to check out their new main bundle, what I found was a bundle dedicated to making games, specifically, a bundle supporting the Indie Games Maker Contest 2015 (IGMC2015). I wanted to find out more about this contest, and as I didn’t know much about IGMC I decided to investigate further. I headed over to the site and had a quick look through the rules and guidelines. At the time I thought it would be interesting to enter, but felt that I wanted to concentrate on finishing my then current project. After I finally wrapped up balloon Pop, I started thinking about my next project and what I wanted to do both in scale and type. I wanted my next project to be another simple-ish project but to be slightly larger in scale, a tad more ambitious. It was then that I remembered the competition and thought it might be an idea to make a game that follows the rules and guidelines, that way if I finish it before the cutoff date, and I think it is good enough, I could enter it into the competition. And so I decided to investigate the competition a bit more. I headed back over to the site and reread the rules and guidelines, making note of the twist growth. At this point the competition had already been running for almost a week, leaving me about three weeks to make a game, which aligned nicely with the amount of time I wanted to dedicate to my next project. After rereading the rules and guidelines, I started brainstorming ideas for projects that were somewhat simple and incorporated growth. I played around with a couple ideas, including a platformer where you must grow a central beanstalk to reach higher levels, but I felt this would take longer than 3 weeks to make. I wanted something simple both graphically and mechanically but still had some depth, whilst also adhering to the theme of growth. 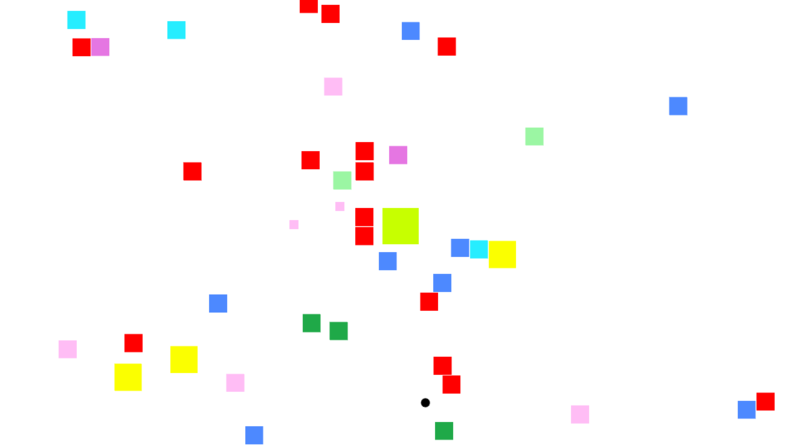 Eventually I settled on an idea where the aim of the game was to protect a central block from a growing number of incoming blocks, and where these incoming blocks could also grow in size. I created a few concepts, settling on a style I liked before starting work on the prototype. For most of the development from prototype to finished game not much really changed in terms of core gameplay and graphical style. Not to say things didn’t change, in fact as a game starts to flesh out you find somethings just don’t work or could be done differently. For example, initially there was going to be a health bar at the top of the screen to represent the health of the block the player must defend. But early in development I decided I didn’t want the top of the screen obscured, so I came up with the idea to use the block itself to take on the role of the health bar, changing colour as it loses, or gains, energy; along with the introduction of a two stage size increase as the energy drops/rises; I also felt this was a nice nod to growth. But for the most part the core remained the same. Centre block changed from single size and colour to increasing in size and changing colour. The majority of development time was probably spent on the enemy blocks, as not only do they add variety to the game, but also because I wanted each block to be slightly different. With different characteristics such as speed or its behavior once it got close to the target. The last thing to really get added, other than last minute particle effects, was the inclusion of turrets and block traps. These were in fact in the initial design outline, but I felt I should leave them until last in case I didn’t have enough time to implement them properly, as the game was still fully playable without them. Thankfully this wasn’t the case however, and I feel they add a nice element of strategy and resource management to the overall feel of the game. 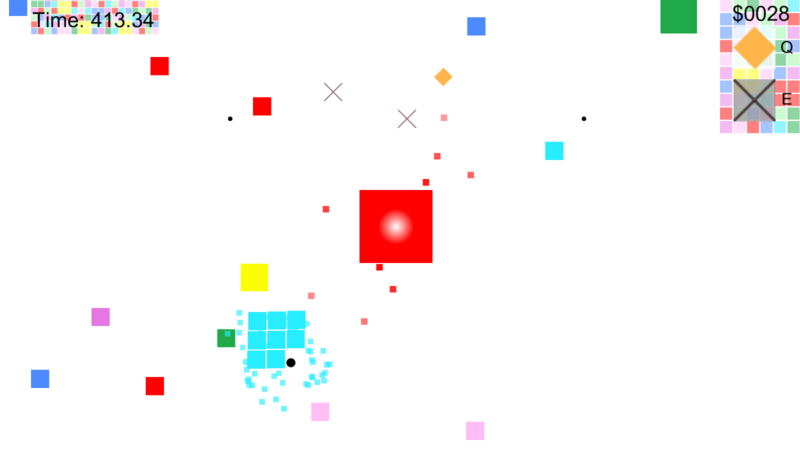 Final game, Particle effects were added to the lifeblock(centre block) and when the player destroys an enemy. Turrets and block traps were also added. I realise the game is far from perfect, with plenty of areas for improvements, such as difficulty balance and different game types etc, but I feel that it’s a good improvement, even an increment on my last project, and was completed in roughly the same amount of time. Overall I’m pleased with how the game turned out and glad that I stuck to the time window so that I could enter the competition, and most of all I had a lot of fun making it.